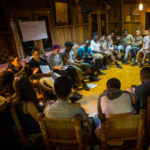 Each of our programs is a unique leadership development, cultural immersion, and service-learning experience that is built on a carefully considered set of program components. Because each country and city has its own unique cultural and physical landscape, the emphasis of each component varies. Below you’ll find a sample itinerary for our Constanza, Dominican Republic program. Students are met by Global Glimpse staff at the airport in Santiago de los Caballeros and then travel by private bus up through the mountainside to Constanza. 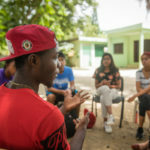 They arrive at their group accommodation, get settled, and attend our Hotel Orientation where they are introduced to our dedicated accommodations provider and staff before enjoying their first Dominican “cena.” Before bed, they have their first nightly meeting to discuss the day’s events and prepare for their next day! Students begin the day with a Culture and Safety Orientation and team building activities. They then meet up with their Local Youth Ambassadors (local Dominican English speaking youth) and together take a walking tour around the city, learning the history of Constanza through a photo scavenger hunt. The tour begins at the “Plazoleta” where students are introduced to statues of the founders of the Dominican Republic in front of an active military base and ends at the local baseball diamond, where they share a snack with the Youth Ambassadors. Students close the day with a discussion about how history impacts the present and prepare for the next day. Students start the morning with a Mental Warm Up to learn some background on the artists they will meet and generate questions for them. The morning is dedicated to a mask making workshop with a local carnaval leader. Students explore how carnaval represents Dominican culture while creating their own mask with clay and paper maché to take back home. For lunch, students eat their first “Bandera,” a delicious typical Dominican staple composed of white rice, beans, salad, and meat. In the afternoon, they join our Local Youth Ambassadors to learn typical dance styles of the country, bachata, merengue, and salsa. The day closes with a discussion on how societies are impacted by culture and explore their own cultural roots. Students are introduced to the partner organization that they will be working with on their service learning project and spend the day understanding the mission of the organization and the needs they are addressing. The students then participate in a workshop to discuss what projects would be most feasible and beneficial to design and deliver in partnership with the local organization. They are then introduced to a community partner whose work supports social and economic sustainability rural communities. Through their discussion, students gain insight on the key factors of sustainable community development. In the afternoon, they break up into small focus groups to interview community members to idéntify community needs and resources to support the Community Action Project (CAP). Students end the day with their first English Tutoring sessions at one of the local schools in Constanza! Students wake up early and take a trip to a local greenhouse where they learn hands on what it takes to harvest cucumbers by spending time with workers and learning about their stories and aspirations. In the afternoon, they follow the cucumbers they harvested to an international exporting company where they see how cucumbers are inspected, cleaned, and sorted by quality. Soon after, they go into their “Design” seminar where they discuss and choose the most sustainable CAP project based on their interviews the day before and develop a panel presentation for their CAP partners. At the end of the day, students reflect on globalization, fair trade, and the impacts of corporations on a developing country. Students have a chance to fully relax and walk around the city accompanied by our Local Youth Ambassadors. They can call their families and spend time uploading pictures at the internet cafe. Students usually do their laundry and hang out at their group accommodation getting to know each other and resting. Students head to “El Arroyazo” a natural reserve nestled into the mountain near Constanza where students enjoy nature, relax, have a picnic lunch, and enjoy cool waters in a natural spring river. In the evening, they head to the famous “Divino Niño” an iconic statue at the peak of the mountain to take in the breathtaking landscape. Students finish the day with their nightly meeting in preparation for the next day’s events. Students spend the morning with workers at the local dump to better understand what they do for a living and the challenges of overcoming poverty. This experience provides a glimpse of poverty in a developing country, but also allows students to understand how their lives are similar and different from the lives of those living in the dump. In the afternoon, students visit a local school created by the workers to get children who work in the dump into the classroom. Students immediately explore how poverty affects education and potential ideas to break the cycle of poverty. On this day students experience and share a full day in the life of a family in the Cañada de las Palmas community. They experience what it is like to live as the majority of the world does; no running water or electricity. Their food portions and menu throughout the day reflect that of the families with whom they share the day. Through partaking in daily household chores, they build powerful relationships with local families who open their homes to small groups of students, each with a student interpreter to guide the conversation. In the evening students reflect as a group on the question of inequality and the larger concept of global poverty. This experience helps students clarify their thoughts on service and prepares them for their community action project. Students spend the morning sharing stories and learning of the endeavors Haitian families endure when immigrating to Dominican Republic. How political and national situations have influenced their decision to leave their country for a new life. They also learn how to make bracelets which are sold as a means of income. 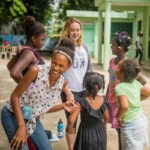 In the afternoon, students share stories, laughs, and lots of dancing moments with leaders in the Haitian community of Colonia Kennedy, a neighborhood of Constanza. They end their days with discussions during nightly meeting reflecting on current immigration policies in the US and how they relate to immigration politics in the DR.
Students prepare and facilitate a panel presentation to the key community members and technical experts of the Community Action Project. Projects range from construction to marketing to event planning and more, but a focus on providing our students with a model for sustainable development and community ownership of the project is our primary concern. The students present how their unique skills can be assets for the project and the community provides feedback on timeline, tools, and materials needed for a successful execution. Students pre-arrange a shopping trip with their CAP partners to purchase needed materials for the project. They then have a chance to relax and walk around the city accompanied by our Local Youth Ambassadors. They can call their families and spend time uploading pictures at the internet cafe. Students usually do their laundry and hang out at the accommodation getting to know each other and resting. During the final week of the program, students have to work together to deliver their Community Action Project. They learn to delegate roles and responsibilities, manage a budget, and set goals. Students work alongside locals to deliver their community action project. Students continue to work on the project and in many cases waking up early to finish before a public project inauguration and a Big Love circle shared with the community. The students gain crucial skills in teamwork, critical thinking, organization, and project sustainability. Students have a chance to enjoy their last day in Constanza, purchase souvenirs for family and friends, and participate in a closing celebration with their English students. Students participate in a structured closing reflection workshop where they reflect on all they have learned and experienced during their GG journey. They have an opportunity to appreciate others for their contributions (GG Leaders, Coordinators, and their peers.) They spend time evaluating the program and identify how they will keep the GG spirit alive back home as Alumni Ambassadors. At the airport, they say their goodbyes to their in-country Program Coordinators and new Global Glimpse family and fly back to the United States.